Is Your Air Filter Working? Home / Air Purification, Heating / Is Your Air Filter Working? We already know the importance of air filters and how clean ones cut utility bills, increase performance, and improve indoor air quality. You are checking your air filter every 30 days, right? But just because you have a central HVAC system and an air filter doesn’t mean it’s working properly. From cheap filters and improper installation to bypass air and lack of airflow, there are many instances when filters don’t work properly. This sounds silly, but you’d be surprised how many times we found no filter at all during our service visits. Obviously, if you don’t have a filter, you’re not going to get much filtration. While the HVAC system can still run without a filter, without one, the blower, coils, heat exchanger, and the rest of your HVAC system will get dirty, leading to increased energy use and decreased performance and lifespan. Sometimes, people remove the filter and forget to put a fresh one back in. Other times, the filter gets inserted in the wrong place. So, number one, make sure you have a clean air filter in the right place. 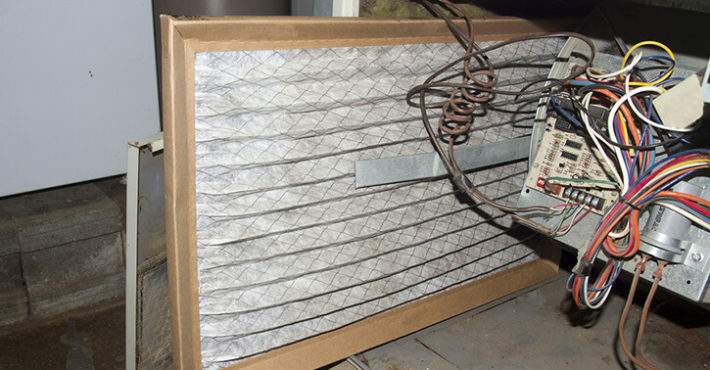 Even if you have a medium or high-efficiency air filter, it may not be installed properly. If the filter is not sealed in the filter frame (off the filter rack, improper gaskets, damaged filters, etc.) air can easily pass through without have to go through the filter. The gaps created by improper installation and/or poor gasketing may seem insignificant, but they can have a huge effect of your filter’s efficiency. It’s almost as bad as having no filter at all. Speak with a professional technician to make sure your filter, filter housing, and gaskets are in good condition and properly installed. Make sure you have the right filter for your HVAC system. If you want a thicker, more effective filter, speak with a professional about installing an appropriately sized filter box. Check air filters for cleanliness every 30 days; replace them regularly. The arrows printed on the air filter indicate the airflow direction. Make sure the arrows are ALWAYS pointed in the direction of the airflow. Ensure the filter is in good condition and properly seated in the filter track/housing. Proper air filter maintenance and installation is crucial for performance and indoor air quality. When selecting air filters, the MERV (Minimum Efficiency Reporting Value) number tells you how effective the filter is able to remove airborne particles. MERV 1 is the least efficient; MERV 16 is the most efficient; MERV 17-20 are reserved for HEPA filters. Cheap, low-efficiency filters (MERV 1-6) can help filter out hair, large pieces of dirt, and insects, but not much else. We recommend a minimum MERV rating of 7. Be careful not use filters with MERV ratings that are higher than what your HVAC system can handle. High-efficiency MERV filters (13 and higher) are much thicker and not recommended without speaking with a professional first. If you have a mechanical ventilation system, air is brought in from outdoors and connected to duct system’s return side. Sometimes, the ventilation duct is improperly installed past the filter so unfiltered outdoor air is sent straight into the ducts. You can also install a filter at the fresh air intake. Speak with a professional about proper filtration for your mechanical ventilation system. Additionally, if you have a lot of air leaks and/or negative pressure relative to the outdoor air, a lot of outside air can enter your home without any filtration. Leaky homes should seal their air leaks and improve insulation. Once you have a tight, well-sealed home, it’s important to have mechanical ventilation. Speak with a professional before deciding on a mechanical ventilation system. Need help with air filtration? Schedule service with us and we will specify and install air filters at your air handler or return grilles, and any outdoor air intakes. We will also make sure filters, filter media boxes, and access panels are installed correctly to prevent air leakage.